Cindy Walsh vs Bobbie S. Mack , Chairman Maryland Board of Elections; Doug Gansler, Maryland State Attorney General; and Democratic Primary candidates Anthony Brown, Doug Gansler, and Heather Mizeur. Cindy Walsh for Governor of Maryland is filing in Maryland Circuit Court because of violations to State Election laws and because of failure to uphold Federal Election laws as Maryland law requires. I am filing in the Maryland Circuit Court in Baltimore City because I am a resident of Baltimore City. a) A claim of election irregularities and request to invalidate an election result can be taken to Maryland Circuit Court. b) Maryland Attorney General Doug Gansler has the power to investigate election violations through the State Prosecutor’s Office. Gansler, as an elected politician has taken an oath of office requiring the upholding of Federal and State Constitutional law including election law and ignored my requests for relief from election irregularities. Date of violation: May 12, 2014; May 20, 2014.
c) The Maryland Board of Elections, Bobby Mack is tasked with ensuring that elections are free and fair and to respond to candidate’s complaints identifying election irregularities and as an appointed state official has taken an oath of office requiring the upholding of Federal and State Constitutional law including election law. Section 2-102 - (a) (b) (1) (2) (3); Sec. 6 (originally Article I, sec. 6, renumbered by Chapter 681, Acts of 1977, ratified Nov. 7, 1978). d) Anthony Brown, Doug Gansler, and Heather Mizeur as elected politicians have taken an oath of office requiring the upholding of Federal and State Constitutional law including election law. Sec. 6 (originally Article I, sec. 6, renumbered by Chapter 681, Acts of 1977, ratified Nov. 7, 1978). 4. The Maryland Circuit Court needs to know the extent of election violations and by which organizations in order to judge this Democratic Primary invalid. The Federal Court case will try these claims of election violation. a) Censure in media and 501c3 events of my candidacy and platform damaged my campaign and denied the voters the right to freedom and intelligent casting of a vote. This was a huge factor in election results and directly changed the course of this primary election. Anthony Brown with 12% of registered democratic voters left 72% of those voters deciding not to participate. Cindy Walsh with 1% of registered democratic voters could have easily won the 15% more of voters needed to win this election if not for the systemic election violations that left my campaign out of primary election events and media. 1) Invalidate the 2104 Democratic Primary due to widespread election irregularities that without a doubt changed the election results. 2) Find the Maryland Board of Elections and Maryland Attorney General’s Office guilty of failing to perform the duties of their office and of obstruction of justice placing these agencies under court supervision for a probationary period of several election cycles until the citizens of Maryland are assured free and fair elections. 3) Find the Democratic candidates for Governor, Brown, Gansler, and Mizeur guilty of failing to honor their oath of office by upholding all Federal and State Constitutional laws especially election law and knowingly participating in events violating election law. 4) Provide the Democratic candidate Cindy Walsh an election venue after being denied one in this Democratic Primary. A spot in the 2014 General Election for Governor running as a Green Party candidate would require the court to suspend general election filing date requirement date of February 2014 and suspending the law that precludes a candidate losing a primary from running in a general election. Also, court protection from exclusion from election events because of third party status. 5) Refund the costs of running this election including candidate filing fees for the candidates for Governor and Lt. Governor and costs of electioneering. Damage penalties from violation of False Statement of Fact should be assessed on venues in this lawsuit. I notified Maryland Board of Elections more than once of my problems with election violations. Besides this email I communicated by contact page on their website. I am running for office in Maryland for two reasons. One, that I am the best candidate for the job of Governor of Maryland. The second is to highlight with the intention of following up after elections the abysmal system surrounding an election and how citizens and voters get their information. I hear from everyone they go to Maryland ballot boxes not knowing most of the candidates and with almost no information on issues. There is no avenue for open discussion on issues. People new to Maryland are struck by the complete lack of free and fair elections or public engagement on state and local issues. Cindy Walsh can win this election without media. Building a network can be done without media's help. I will change this election process either when I am elected governor or soon after as I continue to educate the public as to what free and fair elections involves. Please look at the election websites that represent the State of Maryland elections to make sure they are not biased and/or failing to represent accurately the best of the candidates qualifications. The Politics and Portal website is one that gives equal footing to all candidates in a clean representation of the candidates and easy access to their campaign websites. This is a legitimate election website. Ballotpedia and others have a goal of choosing candidates to highlight. Please see as your duty as the State Board of Election to be oversight of election websites. This is not an avenue open for personal edification. I communicated with Brown, Gansler, and Mizeur letting them know they were participating in election violations. I would appreciate if you would personally announce that ALL democratic candidates for governor be included in these 3 debates. You are the progressive candidate and would not want to compromise 'free and fair' elections. As this newspaper article shows Cindy Walsh was forced to leave the forum with Anthony Brown and Heather Mizeur sitting on stage. I shouted that I had met the requirements placed by the forum and that excluding me was illegal. Brown was wrong to suggest the organizers said only the top candidates would be allowed on stage. I have the emails that show this did not happen. The level of coercion and intimidation was palpable as this forum was controlled by Brown. The biggest drama at Thursday night’s Maryland gubernatorial forum started to play out before any of the candidates spoke. After a stellar rendition of the national anthem, four hopefuls took the stage at an event put on by the Collective Empowerment Group, made up of Prince George’s County ministers. There were only three chairs. Lt. Gov. Anthony G. Brown (D), Del. Heather R. Mizeur (D-Montgomery) and Charles County businessman Charles Lollar, a Republican, took their seats. Cindy Walsh of Baltimore, a little-known Democratic contender, stood awkwardly by until she was waved off the stage by organizers. Around the same time, Del. Jolene Ivey (D-Prince George’s), who was sitting in the front row of the audience, sent a text message to a reporter saying she was supposed to be on stage, too, standing in for her running mate, Attorney General Douglas F. Gansler (D), who had a prior commitment in Western Maryland. Brown campaign manager Justin Schall later disputed Ivey’s contention, saying the organizers had made it clear in an April letter inviting candidates to participate that only the those on the top of the ticket could be on stage. “Regrettably, Jolene hasn’t been accurate about a lot of things lately, and this is just another reckless and irresponsible statement from the Gansler campaign that we’ve all come to expect,” Schall said. Brown aides also suggested it was ironic that Gansler would skip a forum on a day that he launched a new television ad criticizing Brown for missing a televised debate. Below you see the date I communicated with Maryland Courts about heading to Federal Court because of election irregularities. I was inquiring about self-representing as I could not get a response for help from Maryland Attorney General’s Office. I acknowledge communicating with the Maryland Justice department to pursue these violations in Maryland Court and receiving no help. Cindy Walsh for Governor of Maryland is moving to Federal Court with a civil lawsuit claiming election violations in Maryland governor's race. I am preparing to move forward as a self-represent because none of the public justice avenues have acknowledged my complaints in the past. This is my request to the state organization charged with making sure the public has the best legal representation. If the plaintiff is merely a private person, the plaintiff must usually only show that the defendant acted negligently. If the private person wants to recover punitive damages, he or she must show evidence of actual malice. · Identification: The plaintiff must show that the publication was "of and concerning" himself or herself. · Publication: The plaintiff must show that the defamatory statements were disseminated to a third party. · Defamatory meaning: The plaintiff must establish that the statements in question were defamatory. For example, the language must do more than simply annoy a person or hurt a person's feelings. · Falsity: The statements must be false; truth is a defense to a defamation claim. Generally, the plaintiff bears the burden of proof of establishing falsity. Race for Maryland Governor - Maryland Democratic Governor Debate. The Gazette's Corporate Office Douglas Tallman, Editor Vanessa Harrington, Editor 9030 Comprint Court Gaithersburg, MD 20877 Friday, May 17, 2013 7:00am. Listed above are the statutes violated and those organizations committing these violations. I have separated media regulated by FCC from 501c3 organizations regulated by IRS election laws. Please note that I provide a few dates, times, and individuals committing these violations but these practices happened continuously for the 3 months I was a registered candidate so the dates the violations occurred several times a week between February 25, 2014 and the primary election on June 24, 2014. The censuring of my campaign was directly connected to my platform and media gave no avenue for discussion on the most important issues for the citizens of Maryland and especially Baltimore. My platform included oversight and accountability, Rule of Law, and concerns with and the replacing of a global corporate economy with a small business and regional business domestic economy. My platform centered on dismantling public private partnerships and disconnecting from Wall Street leverage and credit in development, it embraces Expanded and Improved Medicare for All , and dismantles Race to the Top and Common Core----- None of these issues were ever discussed in the Democratic Primary and this is a censure based on platform and denies the voters of the right to hear all issues and to go to the polls with knowledge of candidate and issues. Willful and deliberate exclusion by media and 501c3 organizations of democratic candidates while presenting the public—‘the 3 democratic candidates in the governor's race’ is an unlawful misrepresentation of an election and it was continuous. This matter is separate from FCC and IRS equal opportunity requirements for participating in elections . The relief given broadcasters in the ‘uses’ clause is revoked in this case under the clause that imposes on media to operate in the public interest and to afford reasonable opportunity for discussion of conflicting views of issues of public importance. b) Censure in 501c3 organizations, especially the larger public universities, state non-profits, and political groups, especially in Baltimore City and Prince George’s County where voter’s interested civil rights and labor rights are strong, was pervasive. 501c3 organizations are required to participate in elections in ways that do not damage a candidate in a race; they are tasked with educating the public on all issues in the election to allow for all platforms to be heard so voters can go to the polls knowing all the platform issues and candidates. Maryland 501c3s choosing to use guidelines for selection were found to use these guidelines in a most arbitrary and corrupting way. I was on two occasions forced out of buildings having forums under threat of police simply for arriving with an expectation of participation. Intimidation and coercion as to which candidates would participate was prevalent. I was excluded from all University of Maryland system forums and other public university forums. Action 501c3s may advocate for particular issues by must abide by the do no damage in providing forums. No 501c3 organization followed this law in Baltimore and some outside of Baltimore violated this law as well. When a state allows its public universities to openly ignore these 501c3 laws and exclude major platform issues the citizens of Maryland want to hear, you have lost free and fair elections. Below are only several of organizations involved in election irregularities. Church of the Great Commission Rev. Joshua Kevin White is Host Pastor. Collective Empowerment Group, Inc.
BALTIMORE —Candidates for governor in Maryland converged in Baltimore and in Towson for public forums Thursday as the June 24 primary approaches. While forums are informative, they don't provide voters a clear view of how a candidate reacts to adversity. So far the messages in the campaign for governor have been carefully crafted through press releases and staged events. State Attorney General Doug Gansler turned up the heat with a campaign ad aimed at Lt. Gov. Anthony Brown's handling of the state health exchange rollout. He's calling for a special counsel with subpoena power to investigate what went wrong. "There are two major problems with what the lieutenant governor did. One, he denied real people real access to health care. Secondly, what happened to that $200 million, and how are we going to fix it?" Gansler said. "Both of those answers are being covered up, and we need to actually get some answers." Most recently, Gansler called for the elimination of the state prosecutor's office. Polls indicate Brown is the front-runner. He recently rolled out plans to boost affordable housing. He's taking credit for raising the minimum wage, decriminalizing marijuana, passing bills addressing domestic violence and expanding pre-kindergarten during the 2014 session. All the Democratic candidates supported pre-kindergarten expansion. "If we legalize, tax and regulate marijuana in our state, we would generate $157 million in new revenue that I would dedicate to funding universal pre-kindergarten," said Montgomery County Delegate Heather Mizeur, a candidate for governor. Mizeur also wants to create a state-run retirement savings fund. Her death-with-dignity laws would allow doctor-assisted suicides. She would also raise the minimum wage to $16.70 an hour, close a corporate tax loophole and use the revenues to give small business a tax credit to offset raising the minimum wage. Candidates made appearances separately in Baltimore before they went over to the campus of Towson University for a similarly formatted forum Thursday night. While there, all three candidates agreed Maryland's economic policies need work, but they disagreed sharply about how much. Brown praised the developments of the past seven years. He noted that since the recession, Maryland's job growth has exceeded that in every other mid-Atlantic state. He defended recent decisions to borrow money for basic government needs. His opponents took turns after him and did not hear one another's remarks. Mizeur said these debts wouldn't be necessary if not for certain tax breaks and loopholes. Gansler, the last candidate to speak, argued for a comprehensive review of Maryland's tax policy and renewed efforts to recruit more businesses. The Greater Baltimore Economic Forum arranged a panel of business and nonprofit leaders to question the candidates. They focused on plans to stimulate economic growth and make Maryland more attractive to businesses. Brown boasted achievements from O'Malley's time in office: Maryland's triple-A bond rating as it has emerged from the recession, reductions in tuition for public universities, lower crime rates. He said he wants to focus next on making education opportunities more widely available, partially by expanding the pre-kindergarten program. He said Maryland hasn't had a comprehensive review of its economic situation and tax policy in decades, and he considers this a necessary step toward recruitment. He also advocated for more vocational training options for high school students and possibly a high-speed rail between Baltimore and Washington, D.C., which he said could help bring more families to Baltimore. Maryland is gearing up for a heated gubernatorial race. The primary is June 24. Select a candidate to learn more about his/her campaign, background and stance on important issues. News Maryland voters head to polls in 1st June primary June 24, 2014 05:48 EDT ANNAPOLIS, Md. (AP) -- Maryland voters are going to the polls to choose candidates for governor, attorney general and various state and local offices after a heated primary race. Voting precincts open at 7 a.m. in Maryland and will close at 8 p.m. Tuesday. In the Democratic primary for governor, voters will choose between Lt. Gov. Anthony Brown, Attorney General Douglas Gansler and Del. Heather Mizeur. Brown rallied with supporters Monday night at his campaign headquarters in Largo, urging them to keep working until the end. Gansler was knocking on doors Monday night and then attended a lacrosse game with his youngest son. There are four candidates in the Republican gubernatorial primary. They are Harford County Executive David Craig, Del. Ronald George, Anne Arundel County businessman Larry Hogan and Charles County businessman Charles Lollar. Lt. Gov. 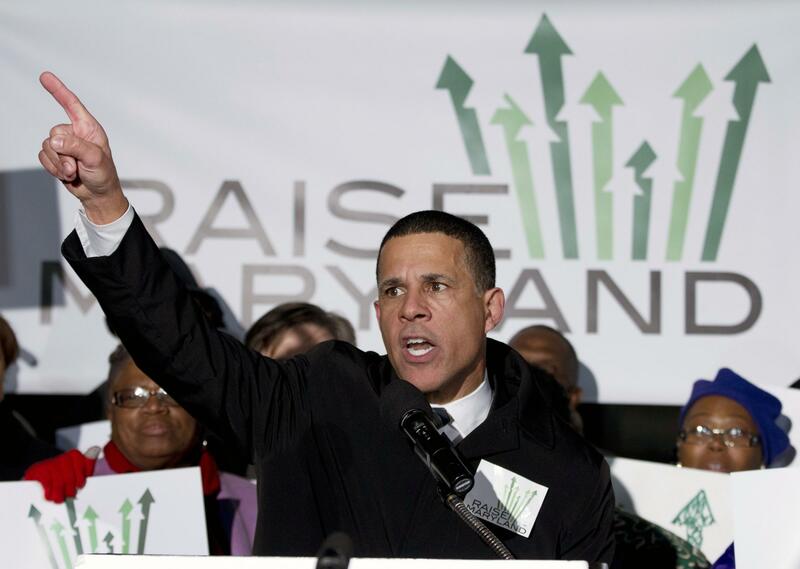 Anthony Brown at a January 2014 minimum-wage rally outside the Maryland State House. Here's a measure of Maryland's Democratic tilt: Even an epic failure in launching the state's health care website isn't enough to derail the political fortunes of the official responsible for it. The Affordable Care Act is that popular. Lt. Gov. Anthony Brown, who was assigned by Democratic Gov. Martin O'Malley in 2010 to oversee the health care law's rollout in Maryland, remains the Democratic front-runner in the June 24 primary. His still-formidable standing is a testament to his political talent, but also to his chief rival's tendency for self-inflicted damage. Doug Gansler, Maryland's attorney general, has made Brown's alleged managerial incompetence a central theme of his campaign. To further his point about Brown's managerial chops, Gansler earlier this week did something rare in American politics — he trivialized a veteran's military service. Brown, an Army Reserve colonel and Harvard Law grad, did a tour in Iraq in the Judge Advocate General's Corps. "I'm running against somebody who has never managed anybody, never run anything," Gansler said at a candidate forum earlier in the week before a group of high-tech executives. "His ads are about how he's a lawyer in Iraq, and that's all fine and good, but this is a real job." Cue the outrage from veterans. "My issue was leadership," Gansler continued. "To be governor, you have a chance to be a leader. And I was questioning the lieutenant governor's leadership in Annapolis because for the first seven years in Annapolis as lieutenant governor he wasn't involved in things and didn't have a role and really didn't do a lot. Then he said, 'I'm in charge of the Affordable Care Act rollout,' " which turned out to be a disaster. When Brown took his turn on the stage at the forum, he demonstrated why smart politicians never, ever, say anything that remotely resembles criticism of an opponent's military service. "One of the most difficult nights of my life was telling my 9-year-old daughter and my 4-year-old son that their dad would be spending a year with the Army in the desert," Brown said. "I went because of the professionalism and courage of the men and women of the 3rd Infantry Division in Baghdad, the same unit I served with 20 years earlier on active duty. I made it back home to my family and the country that we all love." For what it was worth, Brown accepted responsibility for the website failure. "Everyone involved in establishing the health benefits exchange has a responsibility and that includes me," Brown said. Also noteworthy: Maryland is one of two states where Democrats running in primaries for governor are using the ACA to try to score political points against other Democrats. It's also occurring in neighboring Pennsylvania. It's one thing for Republicans to campaign against Democrats using ACA as a weapon. It's an entirely different thing when Democrats do it. Gansler's dismissive comment about Brown was clearly a major failure — but perhaps not his most important one. He has also clearly failed, so far at least, to get Maryland Democratic voters to care much about Brown's mismanagement of the health exchange website's launch. Like its federal counterpart, the Maryland site crashed last fall at the start of open enrollment, delaying the ability of many Marylanders to sign up. It's estimated the state will have spent at least $130 million on the flawed site and its replacement by time it's all over, according to a recent report. Brown, who hopes to become the state's first African-American governor, has a healthy lead in the polls despite the health care exchange misfire. A poll conducted in early April by St. Mary's College of Maryland put Brown's support at 27 percent of Democratic voters, Gansler at 11 percent and state Del. Heather Mizeur at 8 percent. The contest clearly hasn't engaged most Maryland Democrats, however. A majority of them, 54 percent, were undecided. That's not for lack of trying on the Democratic establishment's part. Brown has been endorsed by everyone from former President Bill Clinton, who is scheduled to do a fundraiser in a few weeks for Brown, to O'Malley. Several voters at the forum told It's All Politics that because Maryland is such a strong Democratic state, the botched website isn't as damaging to Brown as it might have been elsewhere. "Maryland did a good job of embarrassing itself but I don't hold one person responsible for that," said Judith Johnson, a retired mental health center director who attended the candidates' forum. She was one of those Brown-leaning Democrats. "I like his style, his calmness. And I like the administration we've had." The Democratic candidates to replace Gov. Martin O’Malley are Lt. Gov. Anthony Brown, Attorney Gen. Douglas Gansler, and Del. Heather Mizeur. The debate moderator will be MPT’s David Salkin. The debate is co-sponsored by the League of Women Voters, Maryland Public Television, and WBAL-TV. It will be held at the MPT studio in Owings Mills. Tonight’s Democratic debate represents the last, best hope for Mizeur and Ganzler to catch up with and pass Brown before the June 24 primary. Political observers believe Brown is running well ahead of Mizeur and Gansler, but the contest may be tightening. For voters just tuning in to Maryland’s 2014 elections — which is most voters — this one-hour debate may be the only chance to compare the candidates side-by-side. And it’s probably the last opportunity, other than television advertising, for the candidates to make a favorable impression on voters. In the precious few minutes each candidate will have tonight, expect Mizeur and Ganzler to make their strongest case to distinguish themselves from Brown. O’Malley cannot run again after serving two terms because of Maryland’s term limit for Governor. The term limit is even stricter in Virginia, which allows only one four-year term for governor. You’ll be seeing a lot of Brown and Gansler on TV between now and the June 24 primary election. Both Gansler and Brown have ample war chests to fund television advertising. Mizeur also plans to advertise on TV, although her budget is smaller. Mizeur hopes to score a breakthrough in tonight’s debate by focusing on issues such as the widening income divide between rich and poor. Meanwhile, four Republicans vying for the Republican nomination for governor debated today. The Republican debate will be aired on WBAL-TV and Maryland Public Television at 7 p.m. Friday night. Today’s gubernatorial debates are expected to be the final joint debates between the candidates before the primary on June 24. Early voting begins June 12. The deadline for registering to vote in the primary is tomorrow, Tuesday, June 3, at 9 p.m.
Show Transcript BALTIMORE —Candidates for governor in Maryland converged in Baltimore and in Towson for public forums Thursday as the June 24 primary approaches. Hard on the news that Baltimore viewers are scheduled to be excluded from a TV debate May 7 among Maryland's Democratic candidates, WBFF (Fox45) said Wednesday that it has "been negotiating for months" with Lt. Gov. Anthony G. Brown, Attorney General Douglas F. Gansler and Del. Heather R. Mizeur for a debate in Baltimore. "We're still confident that details will be worked out," Mike Tomko, news director at the Sinclair-owned Fox affiliate in Baltimore, said Wednesday morning in the wake of dueling press releases among the candidates arguing over a Baltimore-staged debate. Read more: http://www.baltimoresun.com/news/maryland/bs-md-rodricks-0629-20140627,0,1987854.column#ixzz35ytpuwoGWhy can't WBFF get a Democratic gubernatorial debate in Baltimore? April 19--The first negative advertisements in the Democratic primary campaign for governor hit airwaves this week, pushing a feisty political fight that's simmered for months into prime time. Already, the race among Democrats for the governor's mansion is poised to be Maryland's nastiest in two decades, experts said. And voters can expect the candidates with enough money to use it increasingly on negative messages until the June 24 primary. "It's a surprise that it didn't happen earlier," said Donald F. Norris, chairman of the public policy department at the University of Maryland, Baltimore County. Attorney General Douglas F. Gansler has released two television spots and a radio ad that bring his attack on the failed Maryland health exchange to more voters than ever. They implicitly criticize the leadership of front-runner Lt. Gov. Anthony G. Brown, who oversaw the state's health care reform effort for the O'Malley administration. Until now, the television ads in the governor's race featured rosy biographies of the candidates and their policies. Gansler's new ones set off a flurry of accusations through news releases between the two campaigns, with Brown suggesting that Gansler has behaved like a Republican attacking Obamacare, and Gansler shooting back that Brown has dodged responsibility for the flubbed exchange. Brown's campaign manager, Justin Schall, would not reveal when their campaign plans to hit back in television ads, but made clear it will. "This campaign will not allow a single misleading or false negative attack to go unanswered, but we will choose the time and the place to respond," he said. Political observers say Gansler's sharpening criticism of Brown -- as well as Brown's attempt to appear above the fray -- are textbook approaches for both campaigns at this stage of the race. For the time being, Brown's television advertisements have hewed closely to a typical front-runner approach. He relies on biographical spots that highlight his military service and Ivy League education in major ad buys, which most casual voters see, and lets his campaign staff attack Gansler through the news media, which only the more engaged voters will notice. Del. Heather Mizeur, who trails both Brown and Gansler in Democratic primary polls and in fundraising, has not released any television ads. She told a crowd in Baltimore on Thursday night that "what I hear in living rooms and community centers across the state are people ready for politicians to remain positive." While many voters echo that thought, several experts noted that negative campaigning often pays off for an underdog, as long as it's handled well. Public polling earlier this year and internal surveys taken more recently by the campaigns show a wide swath of Democratic voters still undecided. Gansler, according to Norris and others, needs to do something either to get more of those fickle voters in his camp or raise doubts about Brown among his current supporters. But Gansler must tread carefully. "The trick is to not wind up being identified as exclusively negative -- that does not work with voters," said Mike Morrill, a veteran Democratic strategist. And, analysts say, Gansler must not appear overly aggressive in a way that could damage his credibility with black voters, who are likely to represent more than a third of Maryland's Democratic primary electorate. A Baltimore Sun poll in February found that Brown -- who would be the state's first black governor -- had a commanding 61 percent of the African-American vote. The three candidates agree in broad terms about many issues, although Mizeur has staked ground further to the left by backing legalized marijuana and paid leave for all workers, among other policies. Gansler and Brown support decriminalizing marijuana, investing more in schools and taking action to reduce the number of ex-offenders who return to jail, but they differ on some tax issues. Animosity between the Gansler and Brown camps has seethed behind the scenes since last summer. Gansler publicly accused the Brown campaign of leaking negative stories to reporters and decried the use of Brown's political tracker -- who follows Gansler nearly everywhere -- as a dirty trick. Brown's camp repeatedly accused Gansler of acting like a Republican, and produced Web videos suggesting that Gansler favors business interests over the needs of children. Then, in January, Gansler's supporters filed a lawsuit over Brown's fundraising plans. In April, Brown's campaign filed a formal complaint with the Board of Elections over Gansler's efforts to raise cash. Each campaign has also launched a website dedicated to attacking the other candidate. Gansler's attack site -- didanthonybrowncomecleantoday.com -- keeps a running clock on how long it will take for Brown to rewrite a portion of his campaign website that says Brown "positioned Maryland as the national leader" on health care reform. Brown's attack site -- factcheckmd.com -- rebuts claims that Gansler makes at public events about statistics and policy ideas. Gansler has cast himself both as a fighter and an underdog, and his ads broadcast messages his campaign has been sending for months. In his recently released spots, Gansler calls health care "a right," and faults the current state administration for the "mess" of a health exchange, whose rollout was among the worst in the country. "And as governor, I'll deliver health care reform to the people of Maryland, no excuses," Gansler says in one ad. Gansler doesn't mention that Brown was in charge of implementing health reform in the state, but his strategists are poised to make the point for him. "The lieutenant governor is going to be held accountable for a record of failure, and the health care exchange is a dramatic, real-time example of that," said Gansler's strategist, Bill Knapp. "We're going to make it clear to voters that he was in charge of it, he did nothing to fix it, he dropped the ball, he's had no accountably, and no transparency." In response, Brown's campaign pulled out one of its highest-profile allies, 2012 Obama for America campaign manager Jim Messina, to defend Brown to the media in light of Gansler's attacks. In a statement released to reporters this week, Messina said, "Taking a page out of the Republican playbook, Doug Gansler has made false attacks and tried to tear down Obamacare, rather than working to find solutions. While Doug Gansler sat on the sidelines, Anthony Brown took on the challenges of Maryland's health exchange and today more than 313,000 Marylanders now have access to quality, affordable health care. True leadership is finding solutions, and that is Anthony Brown's record." Gansler and Brown are not the only two candidates to snipe at each other. Mizeur has criticized Brown's policies regarding women as "lip service" and, in the legislature, rebuked the O'Malley-Brown administration for not providing more transparency on how much the state has spent on its health exchange website. On Monday, two Republican candidates for governor, Del. Ron George and Harford County Executive David R. Craig, held a joint event to offer their own criticism of Brown on the health exchange. Republicans have clashed among themselves over who should take credit for economic ideas, but the tone of the GOP primary contest is markedly different. "They're really going at it on the other side," George said. "One's trying to hold his ground, the other's trying to make up ground." Gansler campaign aides say they believe their strategy is already working, based on an internal poll they released in part to the media on Monday. Morrill, the Democratic strategist, suggests that the negativity could backfire. "When you wind up having negatives balancing negatives, then you can have the potential for a candidate with a strong positive message ... who can really sweep through the race," he said. Historically, Maryland's Democratic primary contests have not been cantankerous. Morrill worked on what was arguably the last hostile one, the 1994 campaign that led to the nomination of Parris N. Glendening. That year, after Lt. Gov. Melvin A. Steinberg watched his front-runner status slip, he launched a series of negative ads against Glendening, questioning his fiscal management as Prince George's County executive, for instance. The race for governor is by far the biggest attention-getter in Maryland's primary. Anthony Brown and Doug Gansler are among the candidates in the June election. However, with the election quickly approaching, even this big draw has failed to garner voter interest. Brown Way Ahead for Maryland Governor A new Washington Post poll in Maryland finds Anthony Brown (D) holds a commanding lead over his Democratic rivals for governor and tops Larry Hogan (R) in a general election match up by double-digits, 51% to 33%.